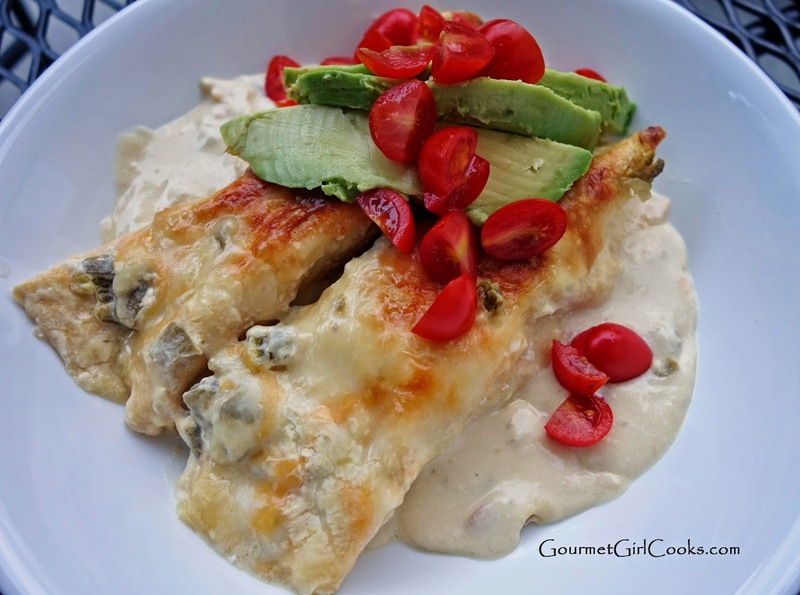 Gourmet Girl Cooks: White Chicken Enchilada Casserole - Low Carb, Grain Free & Out of this World Good! White Chicken Enchilada Casserole - Low Carb, Grain Free & Out of this World Good! Today was a busy day. We started at Einsteins Bros Bagels for breakfast (I brought my own "power bagel"). Then we headed to Costco, Sprouts, Sam's Club and Publix...oh, we went to Kroger too! LOL By the time we got back home this afternoon I felt like I had been around the world and back! When I got everything put away, I immediately began working on a project that will be debuted later this week. Since I had dinner with one son Friday night, only one of them came for dinner this evening. I made one of his favorites, my Chicken Enchilada Casserole. I'm watching the VMA Awards with him until 11:30 tonight so I'm just posting one photo. If you haven't tried this casserole before...put this one on your list of things to try. It is awesome and I swear you will feel like you are cheating. Every time I eat this I can't believe there is no wheat. It couldn't be any better if there was! If you make it, don't fret because you think the sauce looks thin when you pour it over your enchiladas before popping it in the oven. It thickens up beautifully when you let it cool a little after pulling it out of the oven. My meals today consisted of a "power bagel" for breakfast, which lasted me until dinner this evening. I had this awesome Chicken Enchilada Casserole for dinner with a side of steamed, buttered fresh broccoli and I'm about to have a little bowl of my Brownie, Chocolate Chip & Fudge Ball Frozen Yogurt. How does THAT sound for a low carb kind of day? Just so you know..."this chick doesn't want for anything!" ;-) Here' the link for the recipe: Chicken Enchilada Casserole. Enjoy! Thank you sssssoooo much for posting your meals for the day, it really helps me figure out this new lifestyle. This recipe is on my weekend menu for sure! How many servings do you consider to be in this recipe? I could probably eat 2 or 3, but I'm thinking that 1 enchilada is the answer?